Millenials Investing in Real Estate? I thought they all still lived at home? Turns out our vision of millennials may be changing. Some of them, after all, are 35 years old. More and more we are hearing about Millennials and how traditional and optimistic they are. It is refreshing to see a younger crowd that believes in homeownership. Maybe they are not all wanting to live in a rented 500 square foot apartment after all. Stage 1: “We are so excited!! !” You are past the part where you figure out how much home you can afford and now it is time to shop! The budget and the money are all set. While you’re busy on Instagram and Pinterest feeling euphoric and there are sugar gumdrops all over the place in your head. Stage 2: “Wait...this is a lot to think about.” Unfortunately, there’s a lot of deciding involved with buying a home. In a market like ours you have figured this out fast! All of a sudden you feel like you’re drowning in decisions and to do lists! Buying your first home is feeling intense. With help from your real estate broker, you are making a lot of progress. You are seeing some homes you like and things are feeling a lot less overwhelming as you now have a guide to lean on and ask questions. Summer is a popular time to move for many, with May being the official start of moving season. According to a recent study, more than half of moves occur during May through September. It's a new month! And spring is here, with summer soon approaching! I've compiled a few of my favorite ways to get your home ready for summer! 1. Turn your ceiling fan to counter-clockwise. There are a lot of great resources that explain the benefits and the concept of changing the direction the fan blades move. Have any of you experimented with the directions and noticed any cost savings? 2. Adjust the temperature settings on your programmable thermostat, for when you're home or not. 3. Replace old weatherstripping on doors and windows. 4. Check water settings. By this I mean, check your hose connection for any leaks or damage. And indoors, consider using cold or warm water when using the clothes washer. Also, consider lowering the temperature setting on your hot water tank. Making the Best Home Decisions for You! Do you love visiting homes and seeing how it's decorated or staged? 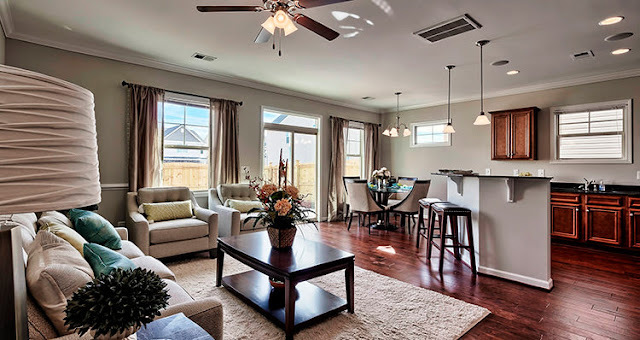 I've had the pleasure of viewing a few homes over the past few weeks, and I can agree with the articles below on some of the trends. Wood floorings have been in almost every home I've seen. I've also seen wood ceilings and ceilings bringing attention to beams, which I love! I love that people are paying attention to their ceilings! I've also seen a lot of the light blues, light greens, light gray, dark gray, maroon, and corals. And everywhere I look, I see wicker and adirondacks. What trends have you spotted? Today's theme for this post: greenery. And no, I'm not talking about Pantone's Color of the Year, Greenery. It's Spring! And many of you are making changes to your home, both inside and outside. I've seen people painting the walls in their home, and I've seen people outside planting trees and flowers and mulching. With Earth Day coming up this Saturday, it's important to bring awareness to environmental concerns, and it's also encouraged to save energy in any way. Design Advice for Your Home! Thinking about updating your home? Or are you buying a home and wondering what exterior siding material you prefer? I've shared some popular home exterior siding materials in North Carolina from Stanton Homes as well as tips and trends for updating your space! 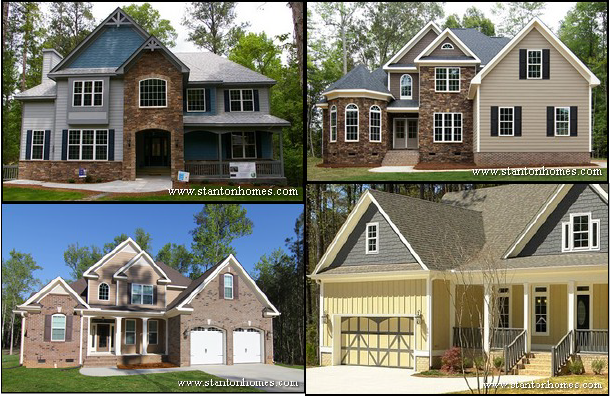 Five trends new-home builders are seeing in the Triangle!